This assessment could be used as a pre-test, quiz, or summative evaluation for a primary grade plant unit. It covers the basic life needs of plants and the plant parts and their functions. Assessment on classifying flowering and non-flowering plants. 4 matching questions, 1 multiple choice question, 13 fill in the blank sentences, and 1 circle the picture question. This one page, three part assessment will help you evaluate your students after completing a plants units. Easy to use and grade, a 12 point rubric is included. Perfect for any science program, including FOSS. 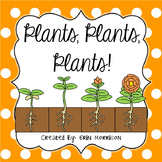 This is a great way to assess students on their understanding of plants. This is a 4 page assessment discussing plants and their classification. This test was made to be used with the 2nd Grade Tennessee Journeys Series Lesson 25. They may be used for other states Journeys Series or for the book. Each test is made up of 5 sections: Vocabulary, Phonics, Reading Skill, Language Skill, and Comprehension.. This is a great assessment to use when studying the classification of plants. This is an 8 question multiple choice and true false quiz. Quick Assessment on plants. It requires students to choose multiple choice, fill in the blanks. It is assessed on the plant cycle, parts of a plant, and plant reproduction. A second grade level assessment on plants. Includes the parts and functions of plants. 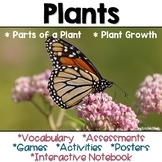 A simple assessment to make sure students know the parts of a plant and what plants need to survive and grow. 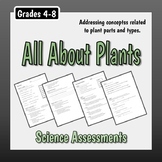 This test assesses student knowledge of plants and plant parts. This assessment tests student knowledge of plants through multiple choice questions and extended response questions. Aligned with 2nd grade TEKS on plants. NGSS 3rd Grade Life Science Resources!